It's been a chunk of time since the last newsletter. My, my, what has since transpired. And in a mere two weeks, all of Alaska will collectively inhale for a record-breaking fifth special legislative session, theoretically, hopefully, to lead us away from fiscal abyss and towards a sustainable financial future. But before all that, let's exhale, and consider how we got to where we are. Five legislative special sessions will be tops in Alaska history. It's like quintuple overtime in basketball, except that the legislature is generating disillusionment instead of adrenaline. The center of Alaska's political world, and the catalyst for quintuple overtime, is the $3.2 billion budget deficit. In honor of the fast approaching July 1 king salmon opener. 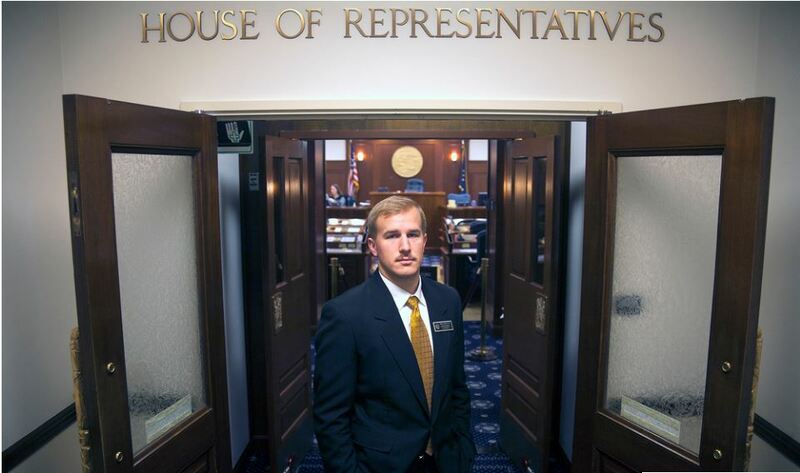 Photo by Sitka's immeasurably talented Berett Wilber, troller deckhand by summer, legislative aide by winter. Budget cuts: $100-plus million (shorthand: $100M) in cuts to services, from ferries to University of Alaska to State Troopers. Increasing taxes on fuel ($49M), fish ($20M), tobacco ($29M), alcohol ($40M), mining ($6M), cruise ships ($15M). Instituting an income tax: 6 percent of whatever you pay the IRS (if you pay the IRS $10,000 you would pay $600 in Alaska income tax), raising $200M. Dramatic reductions in tax credit subsidies to the oil industry. The State of Alaska will pay $775 million in cash tax credits to subsidize oil and gas development in 2016. That number needs to eventually get to zero, or close to zero. 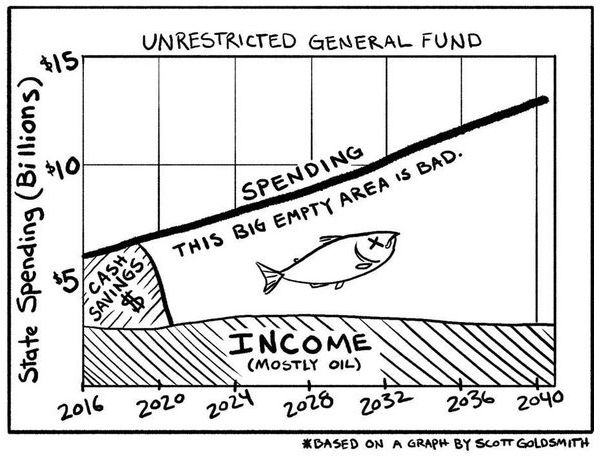 The big kahuna is the Permanent Fund restructure: Alaska's $52 billion golden goose would continue to lay $1,000 (give or take) Permanent Fund Dividends for every man, woman, and child, and the remainder ($1.9 billion) would close the budget deficit. Outside budget cuts, and watered down legislation that didn't do quite enough to reduce subsides for oil and gas development, none of this has happened. That's bad for Alaska. Civically constructive diagramming by the ever-creative Pat Race of Alaska Robotics. It gets the idea across. There's no good answer, that's for darn sure. And I wish I could offer an easy answer, but there's not one of those, either. It's complex. It's frustrating. Perhaps the best answer I can offer is that the failure to take meaningful action on oil tax credit subsidies (which loses votes from legislators in the political middle and the left), in concert with a steadfast ideologically conservative bloc of legislators (resistant to a fiscal plan in general), constitutes the impasse. What's the fair path forward? I grapple with the question. It's tough. It's hard to consider a $20 million tax increase on fishermen, or a $200 million income tax on individual Alaskans, when you're turning around with that same money and writing checks — this year, $775 million — to subsidize private oil and gas development with tax credits*. Is that fair? At the same time, we need action, and soon. Does urgency justify action that is fundamentally unfair? These questions loom in the record-breaking fifth special session of the Alaska Legislature. 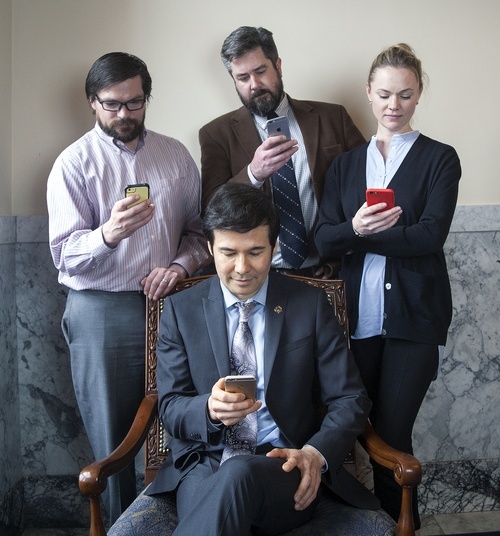 The socially effervescent Rep. Neal Foster (D-Nome) and his text-savvy staff, photographed by Kate Wool. More below on the photo. Let us count our blessings, relatively speaking. On July 1 last year, ~10,000 State of Alaska employees got pink slips forewarning government shutdown. This year we (Alaska Legislature) managed to broker a budget compromise in May and avoid pink slips. When the bar is that low, this qualifies as progress! shaking loose ~$15 million in Cruise Ship Head Tax money, once threatened to be withheld, owed to Alaska cruise ship port communities (including Hoonah and Sitka). Many of these items, and other items, were affected by Governor Walker's line item vetoes. More in the next newsletter with the dust settles. Kate Wool, photographer of great ability and wife of Rep. Adam Wool (D-Fairbanks), visited Juneau earlier this year and shared photos — beautiful in their own way — and words from her visit.